With it‘s wide reach-out and magnificent preliminary results, the PRINTEGER project is published as a success story not only one but two times! The Network of National Contact Points for Science with and for Society publishes successful projects online. With the publications, the network wants to promote excellence in european research that is linked to responsible research and innovation. 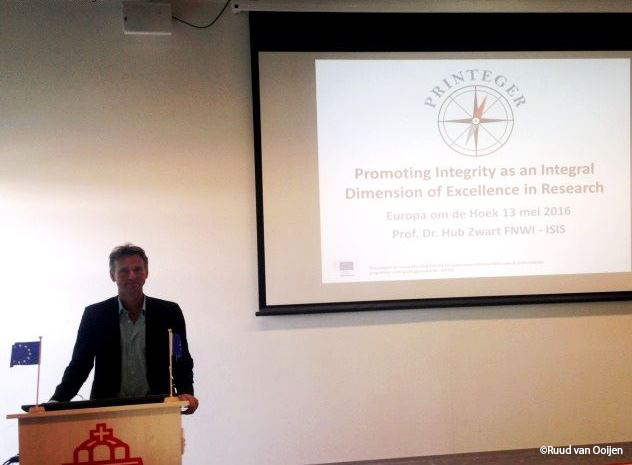 PRINTEGER is soon to be listed among other elaborated projects like RRI Tools – Forstering Responsible Research and Innovation and TRUST – Ensuring global research collaboration without ethics dumping. 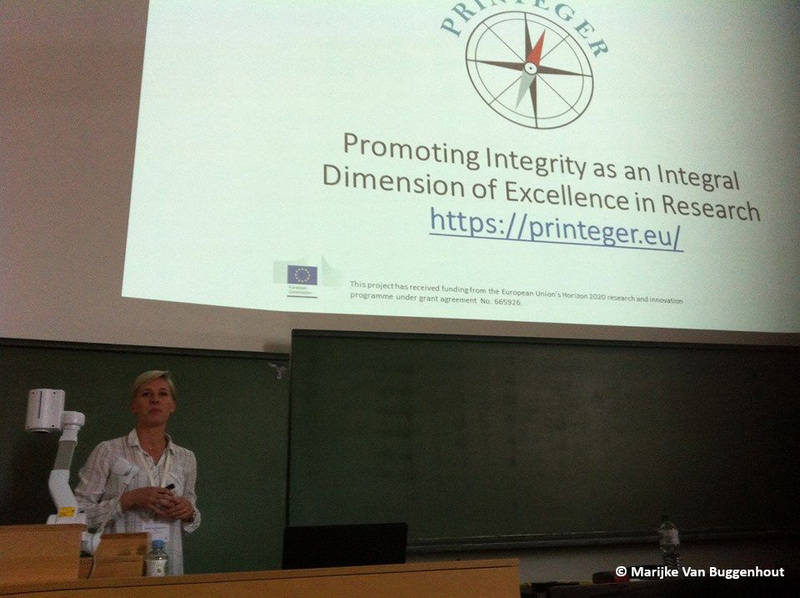 Almost 200 people from all over the world came together in Bonn (Germany) during the PRINTEGER European Conference on Research Integrity to discuss why research integrity matters to them. On day one and day two of the conference (February 5-6, 2018), around 60 presenters addressed a huge variety of topics in four parallel sessions. A committee had chosen presentations based on a call for papers process. Several sessions focussed on good science, where participants exchanged on methods of good science, research integrity as integral dimension of good science and scientists‘ views and understandings of the concept. Other sessions addressed the dark side of research and scientific work: misconduct, fraud and questionable research practices. Why do researchers cheat, what is the role of institutions and how can research integrity committees function as an authority? At the same time, presenters in further sessions considered solutions for research integrity issues and preventions from misconduct. PRINTEGER project participant Vincent Coumans from Radboud University Nijmegen presented how to teach scientific integrity, while Rachel Douglas-Jones (IT University Copenhagen) talked about integrity education in Denmark and the institutionalisation of research integrity in Danish higher education. Not only institutions but the whole research community can become engaged in writing a code of conduct for research integrity, as Margit Sutrop (University of Tartu) reported from an Estonian perspective. Another spotlight of the conference was Maura Hiney‘s (Health Research Board Ireland) keynote speech on February 6, 2018, in which she concluded that actions need to happen across all dimensions. Varying perspectives from early-career scientits to senior researchers, politics and research leaders were discussed in the final panel discussion on that day. The official conference was closed with Ellen-Marie Forsberg (Metropolitant University Oslo) presenting the current status of the consensus statement to the participants. Within the PRINTEGER project, Luca Consoli and Vincent Coumans (Radboud University Nijmegen) are developing an interactive educational tool on research integrity called UPRIGHT. The prototype was ready just in time to try it out with students, early-career scientists and other researchers on day three of the conference (February 7, 2018). The try-out was introduced by Gareth O’Neill (President of the European Council of Doctoral Candidates and Junior Researchers) with an interactive poll: five words you associate with integrity, with “honesty” ranking the highest. When asked which words participants associate with misconduct, students named fraud, falsification and cheating the most. However, context frames your decision, as Gareth pointed out with another poll. Would you rather give back a 100€ bill you found on the ground to a rich banker or to an old lady? While students supported the improvement of UPRIGHT in the try-out session, participants of the consensus conference worked hard on the consensus statement next door. The 20 members of the consensus team came from different fields and countries across Europe to finalize the consensus statement that had been development in the past months. PRINTEGER project partner Ellen-Marie Forsberg (Metropolitan University Oslo) led the process together with PRINTEGER policy advisory board member Matthias Kaiser (University of Bergen). Hard work paied off: At 3 o’ clock, Ellen-Marie handed over the statement to Isidoros Karatzas, Head of the “Ethics and Research Integrity” sector at the European Commission. In a recently published paper from the Printeger project Serge Horbach and Willem Halffman found that there is substantial problematic text recycling (‘self-plagiarism’) among Dutch researchers. Especially in economics, levels are high: up to one in seven published papers contain more than 10% recycled text without mention to original publications. Productive authors recycle text more often, it occurs more in articles with fewer co-authors, and in journals with no clear policies on the issue. Levels are half as high among psychologists, and very low in biochemistry and history. Horbach, S., & Halffman, W. (2017). The extent and causes of academic text recycling or ‘self-plagiarism’. Research Policy. doi:10.1016/j.respol.2017.09.004 (open access). PRINTEGER project partners from Vrije Universiteit Brussel, Department of Criminology, presented the project during the 16th Annual Conference of the European Society of Criminology in Muenster, Germany on 22 September 2016. In their presentation they argued that an “understanding of the expanding ethical mindset in science as a response to the problematization of incorrect behaviors can offer interesting insights from a criminological perspective”. With this regard, the partners draw parallels with the rise of the integrity concept in other professional contexts such as for example police departments and the private security sector, resulting in a wide range of institutional measures, codes of conduct and prevention strategies. The presentation was based on the literature analysis within the PRINTEGER project. The findings within the literature study point to the added value that a criminological perspective, hitherto lacking, can offer on scientific misconduct. Dr Maura Hiney is a qualified nurse (1982) and holds a BSc (Hons) in Microbiology and Biochemistry (1988) and a PhD (1994) in Molecular Diagnostics and Epizootology of fish diseases. She worked as a researcher and as director of research support services in the university sector. 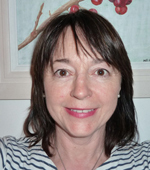 Currently she is Head of Post-Award and Evaluation at the Health Research Board, Ireland. Maura chairs the Science Europe Working Group on Research Integrity and is member of the ALLEA Permanent Working Group on Science and Ethics, where she leads the recently formed subgroup dedicated to updating the “European Code of Conduct for Research Integrity”. In 2015, she acted as expert advisor on research integrity to the Luxembourg Ministry for Research and Education during the Luxembourg Presidency of the EU. She is supporting the PRINTEGER project as a member of the policy advisory board. Read the whole interview here…. The PRINTEGER consortium and further experts met for the Second General Assembly (GA) in Oslo (Norway) from 25 – 26 August 2016. The GA acts as the ultimate decision-making body of the consortium. During the meeting, sessions devoted to specificwork packages (II, III, IV and VI) were held. On day one, partners from the University of Tartu (Estonia) presented results of conceptual exploration within WP II “What is Integrity? Multidisciplinary Reconnaissance”. The consortium continued then with work package III “What Happens in Practice? Discussing normative categories of misconduct with expert Prof. Dr Lex M. Bouter. Institutional Responses to Misconduct”, lead by the Research Group on Law, Science, Technology & Society (LSTS) and Research Group Crime and Society (CRiS) of Vrije Universiteit Brussels. Day two was opened with the University of Bonn (UBO) presenting finalised dissemination activities, next steps and upcoming events (WP VI). 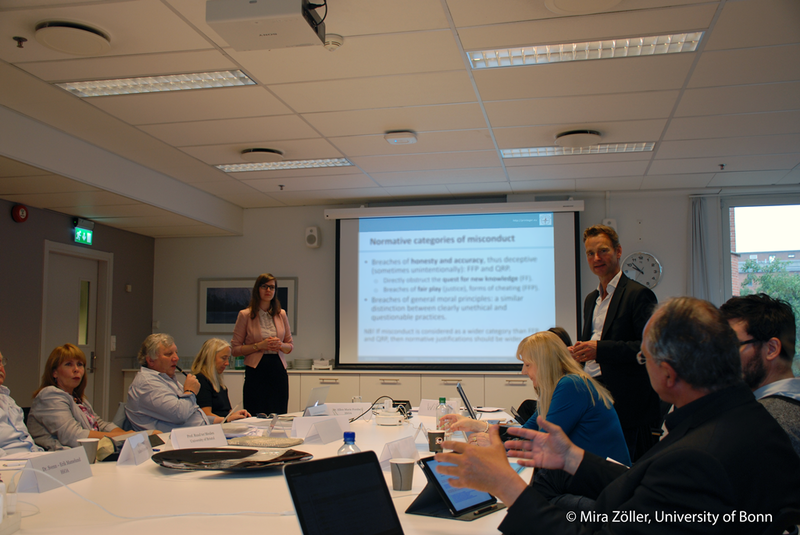 To clarify motivations and drivers as well as complexities of integrity from the perspective of the scientific work-floor, the Oslo and Akershus University College (HiOA) is to conduct a survey with researchers and key informants in the research system (WP IV). The consortium and experts discussed further proceedings for the survey. The meeting was closed with the General Assembly including feedback and advice from the present experts. Teambuilding and exchange of experiences were further important parts of the GA. 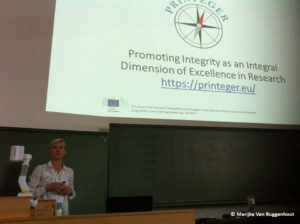 Within the first year of the PRINTEGER project, our partners from the University of Tartu (CEUT, Estonia) concluded their analytic reconnaissance of integrity and research misconduct. The work package aimed to explore important developments and policy regime guidelines, ethical codes and policy instruments. In consultation with stakeholders, it provides improved scoping and articulation of the project objectives, contributing to innovative and more effective approaches. Leiden Univeristy’s Centre for Science and Technology Studies (CWTS) contribution for PRINTEGER focuses on the extent and incidence of misconduct. The research concentrates partly onin-depth case studies that reflect both daily dilemmas and broader issues which the scientific community faces. CWTS has identified two cases. The first case relates to the phenomenon of retractions. Building upon previous work at CWTS, which has been reported at various conferences (STI-Conference in Leiden in 2014 and 4S-Conference in Denver 2015), the team now wants to expand the data collection in a more structural and sustainable way by focussing on retrieving the notifications from the retracted journal publications in the Web of Science. The information to be collected relates to the reason for retraction, as well as to the party responsible for the retraction. Previous work has shown that the reasons are rather diffuse (ranging from honest error to plain fraud), while the parties responsible for the retraction notifications stand in a complicated relation to these reasons for retraction. The second case relates to the appearance of so-called predatory journals. These journals started to appear on the academic landscape with the increasing importance of publishing in open access mode. Open access is that way of publishing whereby not the subscription paid by the readers gives access to scientific knowledge, but the producers pay for making their findings public. Through this method of publishing, scientific knowledge could be made more publicly available than at present. The journals that are labelled as predatory journals’ do seem to have rather high Article Publishing Costs (APCs), without offering the facilities which established journals offer to publishing authors, such as peer review. From the outside this is difficult to assess by an author, particularly when the authors are not yet experienced in publishing research findings. Work on this case is currently in the start-up phase. The work in WP IV shifts attention from a systematic review (WP II) to the work-floor to map out how scientists perceive, experience and address integrity issues. Information is gathered through a web-based e-survey and in-depth focus groups. The work-floor perspective will analyse which integrity issues researchers experience most intensely, which integrity promoting measures they find most helpful, and how they deal with the demands of changing and competitive research environments. Hence this work package, centred in the second year of the project, aims to understand integrity through social science methods. As a part of the dissemination and communication work package, small advisory stakeholder panels are set up by the partners three times during the project period. The first scoping meetings were held between September 2015 and February 2016. The second round is taking place between October and November 2016 where first project results and upcoming tasks will be discussed in local panels. The local panels held by every partner aim to assure that the project’s strong work-floor focus is maintained throughout the project and will provide a voice in priorities and demarcations of the project for the work-floor. 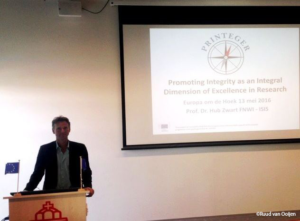 June 2016 || The PRINTEGER project was part of several presentations at the Netherlands Research Integrity Network Conference 2016 in Amsterdam on 25 May 2016. The conference aimed at fostering responsible research practices. 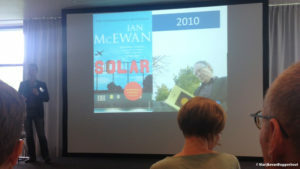 Prof. Dr Hub Zwart (Radboud Universiteit Nijmegen) discussed integrity challenges in Ian McEwan’s Solar – on the use of novels in research and education concerning research integrity in the era of big science. In a session on the RI concept, PRINTEGER partner Marijke van Buggenhout and Prof. Dr Jenneke Christiaens (Vrije Universiteit Brussel) developed a criminological understanding of deviance in science. They argued in their presentation that a criminological understanding of deviance in science is necessary in order to explore the ecology of today’s scientific practice as a knowledge economy, and the elements that are catalyst for misconduct. Serge Horbach and Willem Halffman from the PRINTEGER management team focussed in their presentation on the understanding of the various meanings of ‘scientific integrity’. They concluded from their analysis that there are clear differences between the discourse of ‘integrity’ in policy documents and scientific publications as well as between distinct temporal periods. Further information and presentations can be found here. May 2016 || On 13 May 2016, Radboud Universiteit Nijmegen was one of the locations of the ‘Europe round the corner’ open day. As a main goal, the event aimed at showing people the tangible results of EU policy through projects in their local areas. During the open days, Dutch public bodies, businesses and knowledge institutions showcased their involvement and collaboration in and with the EU. Within this frame, PRINTEGER project coordinator Prof. Dr Hub Zwart (Radboud Universiteit Nijmegen) and project partner Serge Horbach (Radboud Universiteit Nijmegen) presented the project to local residents, friends and partners, business associates, colleagues and students. Approximately 150 people came to the Huygens building to see projects normally not accessible to the general public. Further popular spots at Radboud Universiteit Nijmegen were the Observatory, the High Field Magnet Laboratory, the Felix laser lab, the greenhouse complex with its experimental ditches and a mobile planetarium. The event was organised by managing authorities of the four regional programmes of the ERDF (European Regional Development Fund): the municipality of Rotterdam, the province of Gelderland, the Northern Netherlands Provinces alliance (SNN) and Stimulus, together with the Ministry of Economic Affairs. The campaign won a European Public Communication Award last year. Other EU member states have now adopted the open days concept. 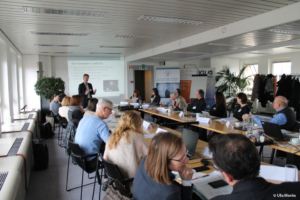 The PRINTEGER consortium met with a panel of eleven European research policy makers on 9 March 2016 in Brussels. Objectives involved safeguarding the realism, relevance and impact of the PRINTEGER project. 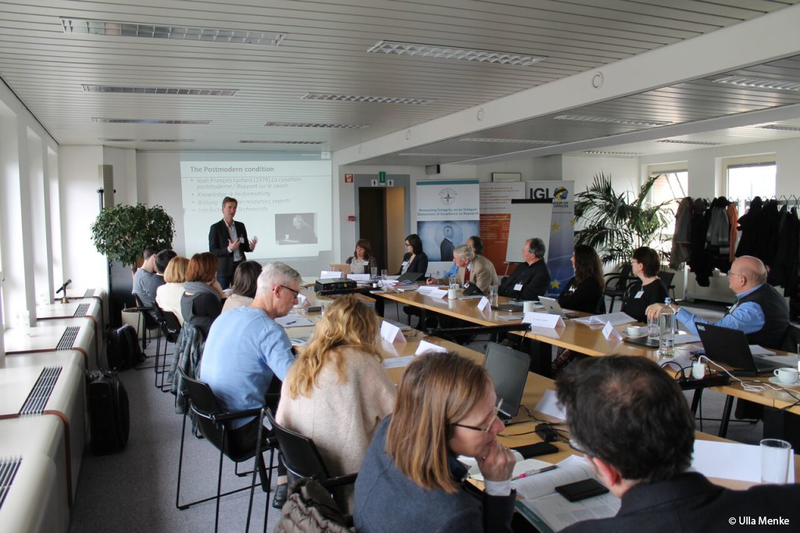 The Panel members supported the project partners to keep a close eye on priorities, salient policy questions, and advice for crucial decisions where policy opportunities or possibilities for coordination with other initiatives could occur. Find impressions of the meeting here. Work on task 2.6 has started, where we will take stock of current literature on organisational conditions for misconduct and integrity and discuss the application on research conducting organisations. Prof. Dr Jenneke Christiaens and Marijke Van Buggenhout (VUB) have started working on the Deviance in Science chapter in task 2.5. In this task, we will take stock of relevant criminological debates to analyse the criminological dimensions of scientific deviance: (1) characterising scientific misconduct as a deviance; (2) understanding scientific deviance as a process where individual, situational and macro dimensions interact. Legal Analysis: Can Scientific Misconduct be Legally Qualified According to Currently Applicable law? At Vrije Universiteit Brussel (VUB), the team of legal researchers comprising Prof. Dr Serge Gutwirth and Prof. Dr Gloria González Fuster has started working on Task II.4 Legal analysis, devoted to a mapping of the legal framing of scientific misconduct – as part of the multidisciplinary mapping of research integrity and misconduct of WP2. In this context, VUB researchers are taking stock of existing research projects and literature, and investigating the legal instruments and notions relevant for the field both at a European level and in the national legal frameworks of the partner’s Member States. The team of the University of Tartu (CEUT) compiled a general list of policy documents addressing integrity and misconduct from all over the world. The number of documents included is impressive, consisting of more than hundred documents. The inventory is a list including the following information: organisation that produced the document, name of the document, date, region, target group, type of the document (e.g. guidelines, statement, report), whether following the policy stated in the document is mandatory, and whether the document describes procedures for dealing with alleged misconduct. In the second stage of the work the focus was more concretely on countries represented in the project. With the help of project partners, more detailed information was added about the documents of research institutions and national policies of participating countries: purpose of the document; whether the document describes rules, principles and/or values; definition of misconduct (if available); possible sanctions, and process of formulating the document (if available). The inventory is a living document and can grow during the project. The kick-off meeting of the PRINTEGER project was held at the campus of Radboud University Nijmegen (RU) on 28-29 September 2015. We had guest appearances of the Head of the University Board, Prof. Dr. Gerard Meijer, as well as the Dean of the Science Faculty, Prof. Dr Stan Gielen. Also, Dr Isidoros Karatzas, Head Ethics and Research Integrity of the European Commission, joined us for a substantial part of the meeting, as well as Hannelis Linders, Head of the RU Academic Integrity Board. The sessions of the kick-off meeting were very useful, and all members are looking forward to make this project a success and meaningful for the European Community. For impressions of the meeting please visit Photos of the kick-off meeting. As a part of the Dissemination and Communication work package, small advisory stakeholder panels have been set up by the partners. These local panels will guarantee that the project remains connected to real concerns in research organisations and provide a fresh look at the project. The panels have to assure that the project’s strong work-floor focus is maintained throughout the project and will provide a voice in priorities and demarcations of the project for the work floor. First scoping meetings took place between September 2015 and February 2016. The partners introduced PRINTEGER and the stakeholders demonstrated their interest in the project and expressed their ideas as well as recommendations on the topic. After the meetings, short reports were drafted.